Continuous Positive Airway Pressure (CPAP) is a device that delivers oxygen by way of positive airway pressure through a nasal, oral or oronasal interface during sleep. A pressurized mask is worn over the nose and/or mouth, and it is attached to a small pump which forces air into the airway. For those who suffer from sleep apnea, CPAP devices can be the solution that they have been searching for. 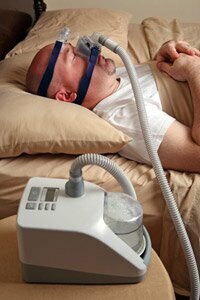 CPAP can provide true rest at night for those who have been deprived due to their sleep apnea condition. Those who are new to CPAP technology might be a little jarred at first when they realize some of the difficulties of having to sleep with a CPAP mask on at night. Even though CPAP masks and machines might take some getting used to, if given time, they can drastically improve one’s quality of life by offering true rest and sleep at night. Dr. Walter Heidary can help to determine if you would benefit from a CPAP machine. You can contact us today to set up a home sleep study. Click the button below to book a free consultation.